Whether through scapegoats or martyrs, the dustbins of history are filled with conflicts born out of blaming others for one’s misfortune. The history of Others is also the history of acceptance and differences. Why are we so determined to exclude those who do not resemble us? Punish moral dissents? Or turn a blind eye on those who fall prey to society’s ever increasingly disregard? 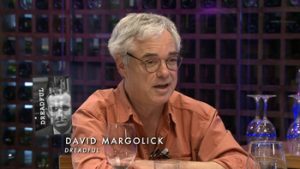 David Margolick, “Dreadful: The Short life and Gay Times of John Horne Burns” portrays the once-celebrated largely forgotten author of what’s arguably the first great gay novel in American literature. “Dreadful” retraces the breathtaking rise of a writer hailed as a worthy successor of Hemingway, John Dos Passos, only to vanish as quickly as he appeared, in just six years. 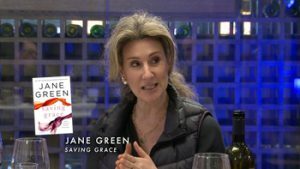 Jane Green, “Saving Grace” is about Grace Chapman who lives comfortably with her husband, bestselling author Ted, in picture-perfect farmhouse, until Ted hires the young Beth, who quickly threatened Beth’s marriage. Losing her center, Grace falls into a whirlpool of paranoia and psychotic drugs, as she is misdiagnosed with mental illness. 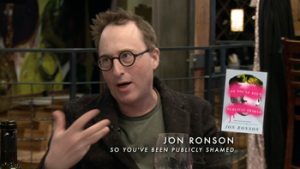 Jon Ronson, “So You’ve Been Publicly Shamed,” investigates the world of public shaming, where social media has made everyone a vigilante and where a poorly phrased tweet or comment can catapult a person to Public Enemy No 1 overnight. Ronson follows up with those whose lives have been left in tatters and questions those being most cruel in the anonymous internet playground. We are seeking $40,000 to take our weekly literary TV program, “Books du Jour,” nationwide on PBS. It cannot happen without your help. Below is an excerpt of the campaign . . . Looking forward to having your support! “Books du Jour” is a weekly literary TV series about books and the people who write them, currently broadcasting in the North-East on LIFE 25 (NYC), Wednesdays at 10:30 pm. The program also re-runs 5 times a week at various times. “Books du Jour” has a simple premise: each week, the host, Frederic Colier, invites three authors to lunch in one of New York’s finest restaurants to talk about books, ideas, society, culture, and of course the world at large. “Books du Jour” covers all genres and types of books and writers, even self-published ones. We have grown tremendously since our modest beginning and, achieving syndication on PBS is a sign that we are taking steps in the right direction. As a result of the strong interest in our series, its growing audience and high production value, we have been accepted for syndication with American Public Television (APT), the main supplier of programs for PBS affiliates. We want to deliver 12 to 16 episodes for our next season. Because our program falls under the life-style category, it is not eligible to receive licensing fees. In other words, we have to raise money to pay for our broadcasting fees, closed-caption, various delivery formats, and data storage units. All the money raised goes towards these expenses. We are hopeful that once we broadcast nationwide on PBS, that Sponsors will help us cover the series’ production costs. Our “Books du Jour” did not start as the large production at all. The series is the outcome of an older program, Book Case TV, which started with two people in a cluttered NY studio apartment, producing short one-on-one author interviews, which were then posted on YouTube. The segments were shot with a single camera, Iphones and still cameras. Just six weeks after starting our venture, NYC LIFE offered us a TV deal. Suddenly, we had access to a 20-million-people reach in the NY Metro area. It did not take long to build word of mouth and get the attention of the creative and publishing industry. The demand for interviews grew so fast that we had to rethink our strategy. Our one-on-one interviews were too limiting. We ended up doing 34 x 30 mn episodes of BCTV. Books du Jour was born from the success of BCTV. Our two-first seasons include 25 episodes shot with five cameras, a full production team and elaborate graphics. Our partner, NYC Media, has been instrumental in the growth of the program by providing massive logistic support: from crew to post-sound and a successful marketing campaign in subway, buses, and taxis, while LIFE 25 contributed to our growing momentum by broadcasting and rerunning the episodes 4-5 times throughout the week. If you are an avid reader and love learning, immersing yourself in romance, sci-fi, thrillers, science, literary fiction, sociology, history, memoirs, or whatever you like, you know that chances of seeing your favorite authors on TV, unless he or she is already famous, are dismal. If you want the chance to get to know your favorite authors, here is your chance to get directly involved. Your small contribution will get them in your own living room and on your personal device. In helping us, you bring books, reading, and knowledge to the world. To get to broadcast across the country, we need your support to cover closed-captions, data storage, and the main expense: our broadcasting fees. For your support, we are offering obviously a wide selection of books (we have hundreds to give away) but we wanted also to mark your support with something special. Depending on the amount of your contribution, we are giving you artworks: photos and drawings in various sizes, signed by the artist, and if requested framed. We have already succeeded in getting our program off the ground, as it is already broadcasting in the North-East. This was the hardest step. But do not think that the next one is easier. Growth implies careful planning and outside help. Our goal is to make our program accessible nationwide since, clearly, there exists a voracious reading audience across the country. Should we fail at raising the funds, not only our hope to go national would be compromised, delayed for sure, but we will also be depriving the reading and book communities with wonderful opportunities to hear new voices. This program is a public necessity: good for everyone: authors, publishers, retailers, and of course readers. Going National with your support would certainly facilitate our task. We are facing a two-prong challenge: raising money for Broadcast and for Production. We have managed to produce our program on shoe-string budgets. No one gets paid. We have showed incredible resilience in the face of challenging time schedule and demand. We are already actively looking for sponsors to help us make this program a full-time venture. Failure to raise money will put set us back a year or two with our goals, and will force us to pedal twice as hard to get there. But we will keep on pushing forth and make bigger waves until we reach our goals.